The exceptional handmade Riesling and Zinfandel glass of the eye-catching glass collection Fatto A Mano stands out due to a red stem. 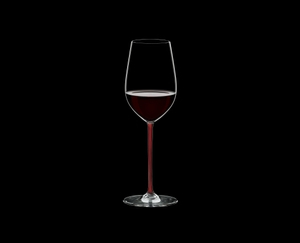 The shape of the glass best supports the characteristic bouquet of fruity red wines or floral white wines – aroma and taste are dominated by fermented grape juice and the flavor of yeast. Combining the sophistication of handmade glass in the style of the ancient Venetian tradition with the very latest glass making technology. All RIEDEL glasses are dishwasher safe.